SIMPSON BAY, St. Maarten (April 24 , 2014) - “We at the Princess Juliana International Airport, SXM, are very proud of newly-crowned Carnival Mature Queen, Anna Rabess-Richardson. She clearly dominated the Pageant and was a deserving winner,” said SXM Airport managing director, Regina LaBega in congratulating the new Mature Queen. “We also note with pride that Tamara Groeneveldt was first runner-up. We congratulate all the seven beautiful women who took part in the Pageant for a job well-done,” Labega added. 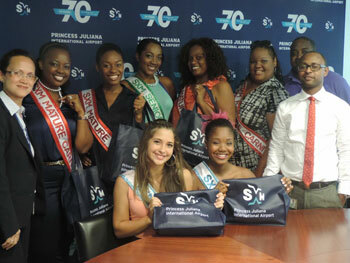 SXM Airport had sponsored five of the seven contestants for this year’s Miss Mature Pageant. The airport also supported the two participants in the Teen Queen Pageant as well as one in the Senior Carnival Pageant. In addition, five revelers received sponsorship from SXM Airport for their road pieces in addition to supporting several other carnival activities such as the Day Break Fête and Ram n’ Jam. “Carnival is an expression of our culture and we take pride in lending support to this 45th edition, especially in the same year we are celebrating our 70th Anniversary,” LaBega concluded.